“She dipped down a hill by a transverse lane into the small town or village of Evershead, being now about halfway over the distance. She made a halt here, and breakfasted a second time, heartily enough--not at the Sow-and-Acorn, for she avoided inns, but at a cottage by the church." And the very place that tragic Tess of the d’Urbevilles avoided in fiction was this little country inn that Thomas Hardy would have known in real life. Also of historic interest, although difficult to confirm, is that Judge Jeffreys (he of the Bloody Assizes) is said to have temporarily held court in what is now the lounge of the building. Those condemned to death (as was his tendency) were hanged nearby. 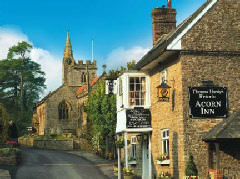 Originally known as the Kings Arms and reputed to date from the 16th century, The Acorn of today features 10 guest bedrooms, each named after a Thomas Hardy character or place. The Acorn Inn is dog friendly.